Invisalign is the virtually invisible way to straighten your teeth using a series of clear removable aligners without metal wires or brackets. You wear each set of clear aligners for about two weeks, removing them only to eat, brush, and floss. As you replace each aligner with the next in the series, your teeth will move – little by little, week by week – until they have straightened to the final position your dentist has prescribed. You’ll visit The Dentist Office about every six weeks to ensure that your treatment is progressing as planned. Total treatment time averages 9 to 15 months and the average number of aligners worn during treatment is between 18 and 30, but both will vary from case to case. 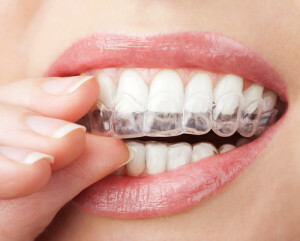 individualized series of custom-made aligners. The patient wears the aligner for about two weeks while the teeth move incrementally. After two weeks, the current aligner is replaced with the next one until the final postion is achieved. Aligners are clear and nearly invisible. If you’ve ever seen clear tooth-whitening trays, that should give you a good idea of what aligners look like. Invisalign aligners are custom-made to fit and move your teeth. Each time you change to a new aligner, there may be some temporary discomfort while your teeth adjust to their new position. This is completely normal and is a good sign that the treatment plan is working. Will wearing Invisalign affect my speech? Invisalign only works while you’re wearing the aligners, so we recommend that you wear your aligners full-time, day and night, except to eat, brush and floss your teeth. We call this the money question for a lot of reasons. Cost is always a concern and we do everything possible to hold the expenses down, especially compared to other dentists. But keep in mind, just as important as cost is the passion of the dentist to measure and examine your teeth accurately and specify the exact right aligners. Once we examine your teeth, we’ll be able to answer the cost question, and we promise it will be extremely competitive, especially given the time we’ll spend with you to make your experience the best possible. Yes. We’ve had tremendous success with them in straightening teeth as have other dentists nationwide.